The last couple days have been just what I needed. 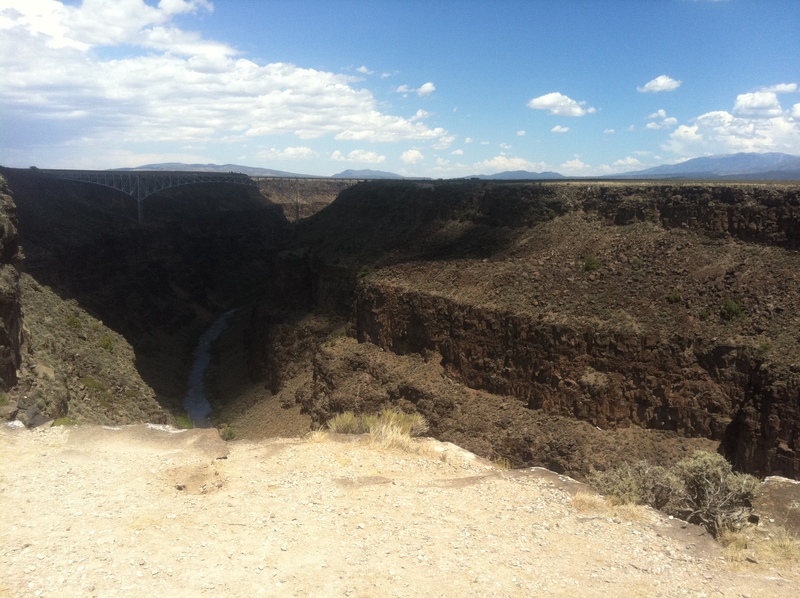 I made it to Taos on Monday. Unfortunately, the weather had me turn back for my Day 1 run. Right when I got to the trail head the rain started. That’s no problem but the lighting was striking all around me and that is one of the few weather phenomenons that will cause me to skip a run. After Saturday’s race I was eager to get right back on trail to see how many miles I could pile up in the week I’m apart from Al and Sagan. I got 18.6 Saturday, drove Sunday and Monday, and was really itching to get to it Tuesday. Northern New Mexico has been dealing with major forest fires and hot, dry conditions across the state. 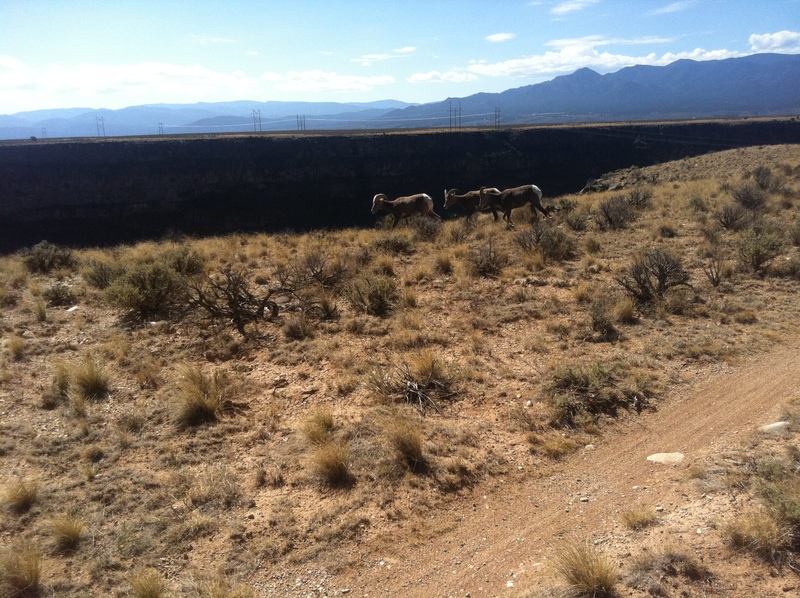 So, sadly, the entire Carson National Forest – the big one out here – is basically closed. That means the trails are off limits, including many of the most challenging and iconic ones. So, not as much true mountain running is available but that doesn’t mean there aren’t plenty of places to get in miles, and there is still lots of isolation and long, jaw-dropping scenic views for those willing to look. 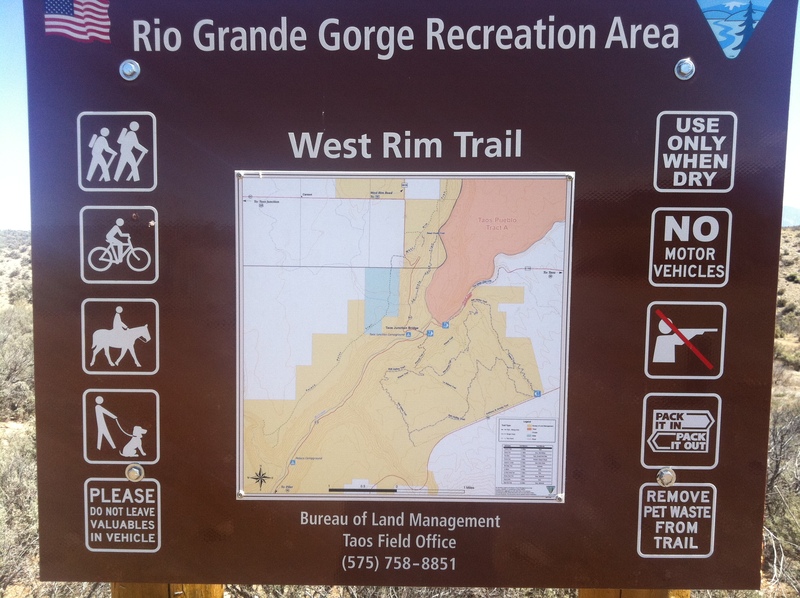 Tuesday morning I set off on the Rio Grande Gorge Trail (West Rim Trail), completing the 18.5M round-trip in 3:20. It is one I know well, having run all of it back in March and sections of it a number of other times. The actual trail is slightly rolling and has lots of twisting but it isn’t too technical. It parallels a crazy steep, nearly vertical, 500+ foot high valley of rock carved by the Rio Grande. 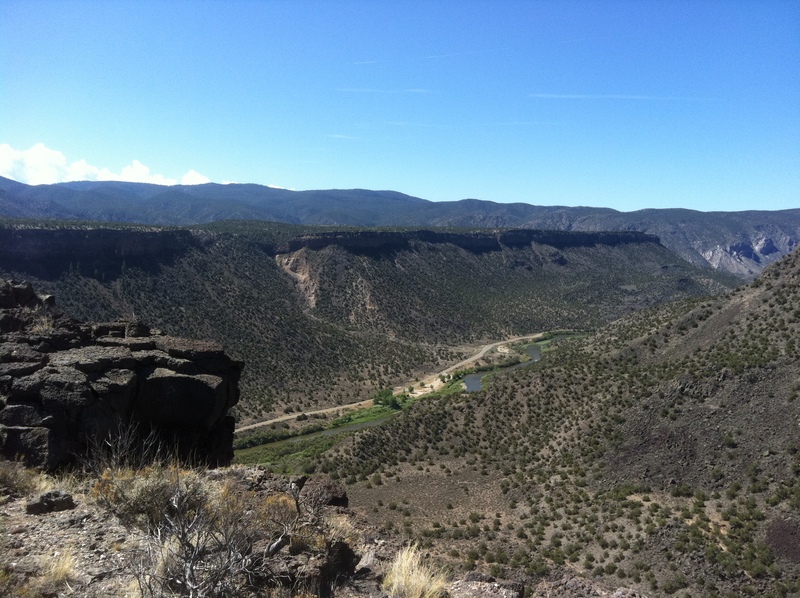 I started at the north end by the Rio Grande Gorge Bridge, ran south to the turnaround at the Orilla Verde Recreation Area, and back. On the run I started at the same time as four folks on mountain bikes. It seemed to be a guide, and tourist father and teenage daughters. It created an interesting challenge on the way out: could I beat them to the end point (my halfway point)? We leapfrogged each other for over an hour an a half but, due to their occasional breaks along the way, I was able to finish the 9+ miles about 3 minutes ahead of the group. Pretty cool. And that was even after stopping twice, not really by choice, due to big horn sheep blocking the trail. It is desolate and dry out on the mesa and I usually don’t see much wildlife other than lizards and, in winter, jackrabbits and maybe some elk way off in the distance. But these sheep were, at one point when I was trying to be brave and inch forward towards them for a photo, only about 25 feet away. They call them “big horn” for a reason and I wasn’t sure if they were prone to charging if they felt threatened by a menacing potential predator. Or a skinny, confused looking me. I found out later from a local that they are not at all interested in hanging out with people, either for fighting or snuggling. They often hang out near the gorge rim because they can, somehow, flee down the side of the cliff if they need to get away from danger. I’m not sure what danger that might be or how, without carabiners and climbing ropes, they can make it down any section of the cliffs. I tacked on the short but technically tough half mile of a neighboring trail to get up to 9 miles, then got in another 6 on the West Rim trail that is starting to feel like a home course for me. 15 miles all together, in 2:55. I was ready to get out of the heat, which has been close to 90 at the tail end of these recent runs, and clean up. The heat isn’t horrible and the low humidity is fantastic but after 3 hours or more of running my clothes are crunchy, my body sticky (gels, dammit), and I just kind of have to knock the trail off of me. But, clean, cooled, and rested, I’ll head back out this evening if the lightening stays away. Just got back from run #2 for the day. This one was a bit less ambitious: a 6M out-and-back on the road from the strikingly cool HomeExchange house that is base camp for the Taos portion of the trip. I managed to finish these 6 miles in under an hour, which I’ll score as a win given the toll of the other 34 miles I accumulated in the previous 33 hours. Of all my favorite places to run, rural back roads lined with trash-strew-hillbilly-infested-junk-pile-shacks is low on the list. Those are the spots that come one of a runner’s least favorite sights: many angry dogs who object mightily to anyone the can see, hear, or smell within about a mile. After a couple of close calls with dogs on multiple trips to Taos, I now always carry both pepper spray and, should that not do the trick, my knife. I’d hate to use either and usually the loud “back!” is enough to avoid further confrontation but I just don’t know what to do when running in rural areas. The dogs are tough and intimidating and can close on a runner from across the street in just a couple of seconds. I welcome advice from fellow runners, dog lovers, and/or anyone not wanting their groin ripped out.